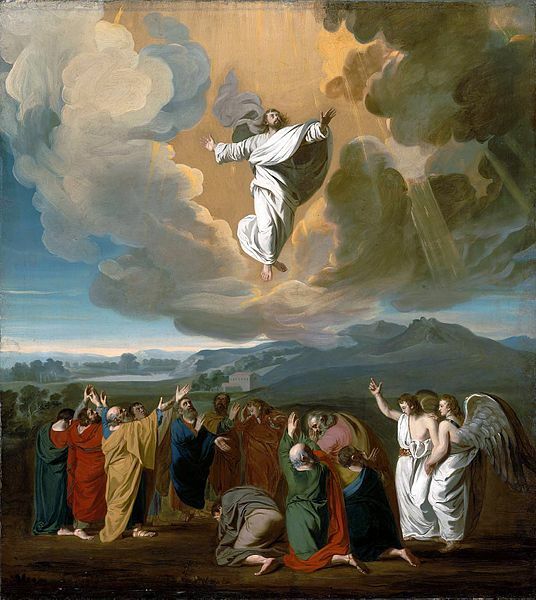 Home » Catholic Questions » What is Pentecost Sunday? If you've finished off all the Easter candy (even the ones you hid from your children! ), it's time for another sweet treat: a birthday cake. On May 20 of this year, we celebrate the birthday of the Catholic Church. 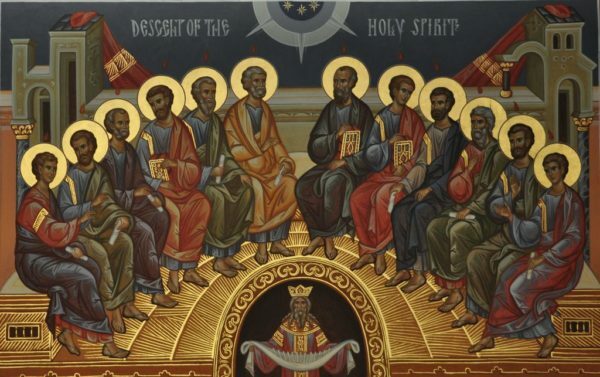 This holy day, Pentecost Sunday, is so vital to the mission and existence of the Church that is falls directly behind Easter and Christmas in importance. Why? "Paul had decided to sail past Ephesus in order not to lose time in the province of Asia, for he was hurrying to be in Jerusalem, if at all possible, for the day of Pentecost" (Acts 20:16). What happened on Pentecost that made it so important in the early Church and why do we still celebrate it today? The Apostles, Mary, and other followers all gathered in one place to pray continuously after Jesus had ascended to heaven. They had been praying for nine days, which is the basis for the Catholic devotion called a novena (nine days of prayer for special intentions or needs). What were they praying for, as sheep who were suddenly without their Shepherd? Probably protection, guidance, courage, not to mention wisdom, understanding, fortitude. The Holy Spirit answered their prayers by joining them in dramatic fashion on the tenth day. "When the time for Pentecost was fulfilled, they were all in one place together. And suddenly there came from the sky a noise like a strong driving wind, and it filled the entire house in which they were. Then there appeared to them tongues as of fire, which parted and came to rest on each one of them. And they were all filled with the Holy Spirit and began to speak in different tongues, as the Spirit enabled them to proclaim" (Acts 2:1). This scene was so astonishing that the crowds out in the street accused the Apostles of being drunk early in the day. The Holy Spirit can inspire that kind of radical change when we open up to Him and ask Him to work in our lives, as the Apostles and Mary spent nine days fervently doing. 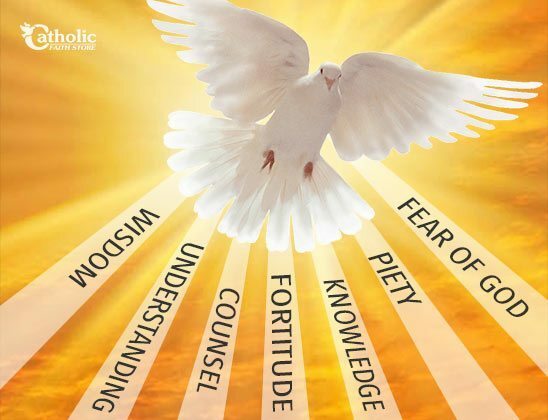 These are seven dispositions which Jesus Christ embodied perfectly and which we can only hope to achieve with the help of the Holy Spirit, who helps us to grow in holiness. To the seven gifts, we must add the seven virtues, and together these prepare the soil of our hearts for the blooming of the 12 fruits of the Holy Spirit. Seven + seven does not equal 12 in arithmetic class, but in Catholic math, it works out divinely! What are the seven virtues? charity, joy, peace, patience, kindness, goodness, generosity, gentleness, faithfulness, modesty, self-control, and chastity. "The Holy Spirit creates diversity in unity, because in every time and place He gives and nurtures different charisms and graces. And he does so in a way that 'effects true union, according to God’s will, a union that is not uniformity, but unity in difference.'" “This is how the word of God describes the working of the Spirit: first He rests on each and then brings all of them together in fellowship. To each He gives a gift, and then gathers them all into unity." We are each blessed with the gifts we need for the mission, but when we join our gifts with those of others on the same journey, then our diversity and union collaborate powerfully and synergistically. A young, contemplative parish priest once described Jesus as the epitome of a good leader. Effective leaders do not take all the work upon their own shoulders. Instead, they delegate tasks to the workers best equipped for each job. When Jesus took physical leave of His Apostles and followers, He did not do so without leaving instructions for and passing the baton to His chosen earthly leaders. He had already bestowed on them the Authority to continue His Church and the power to forgive sins, to heal the sick, to cast out demons. 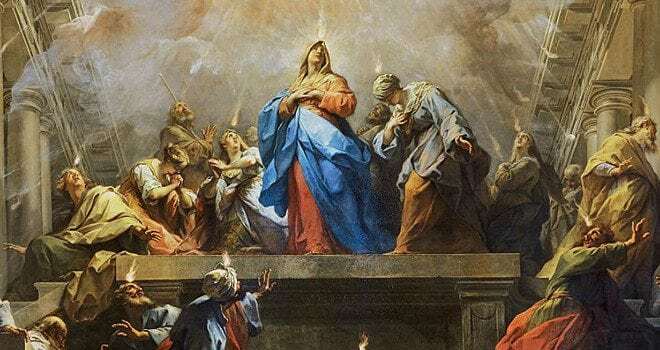 The coming of the Holy Spirit sealed the Apostles, Mary, and His other followers with the strength they would need to carry out the singular task of the Church: to evangelize to the ends of the world during a dangerous time. Pentecost was an event in history, but what happened on Pentecost continues daily. 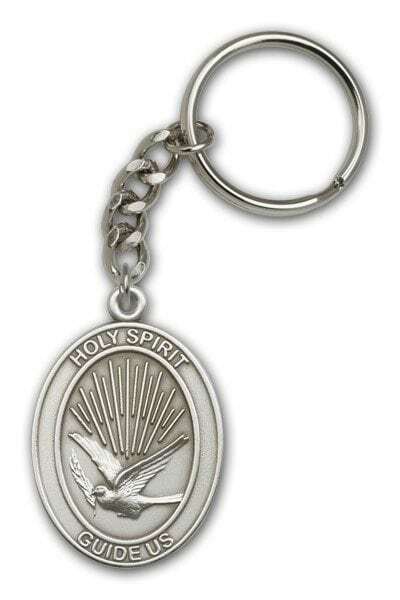 When we ask the Holy Spirit for His gifts to do God's will, Pentecost lives on. When we practice the seven virtues in concert with our God-given gifts, Pentecost lives on. When others see Christ anchoring our daily lives through the 12 fruits of the Holy Spirit, Pentecost lives on. When young men and women receive the Sacrament of Confirmation, Pentecost lives on. Keep the flame of Pentecost alive in the world by fearlessly spreading the Good News to a world which desperately needs to hear it!